We have some pretty resilient slugs down our way happily munching lots of things, not least foxgloves, a plant they are supposed to loathe. I’ve striven to be as eco-friendly as possible as I’ve slowly created my own herbal garden over the past few years. Obviously the plants I grow will ultimately be ingested so I work hard not to introduce chemicals into my beds. However, when it comes to pesky slugs, I’ve struggled to find a natural way of dealing with them. In previous years on damp evenings, I’ve gone out with marigolds, a torch and a bucket to collect them as they decimated my seedlings. It’s amazing how many you can remove this way but it’s fairly revolting and, to be honest, there are about a zillion things I’d rather be doing. So I began to look at other options. Years ago, I flat-shared with a horticultural student and I remember her slug-repellent project. She spent a month testing various remedies for this age-old problem. First off she tried placing gravel, egg shells and coffee bean grounds around the nibbled plants as, apparently, slugs don’t like travelling over rough, dry surfaces. All three of these solutions worked for a short while but within a week the little blighters had circumvented the crunchy surface and were nibbling again. Next she tried beer traps dug into the beds – this was hopeless. I remember my mother trying the same thing with slightly better results so maybe the slugs didn’t think much of my friend’s choice of ale? Then she tried copper wire which would have worked if the neighbourhood cats hadn’t thought it great fun to dig the lot up as if they were fertilising the garden. Finally she had a go with garlic oil spray. Result! It worked by repelling or killing them. I’ve tried the spray in my own garden with some success. However, there were still areas where our stoic super slugs carried on crunching. I began to look again at what they dislike and, as it turns out, there are quite a few plants they can’t stand. These include chives, fennel, wormwood, lavender and sage. I also discovered that slugs have an aversion to rosemary and thyme. Noticing these were some of the only plants left alone in my garden, I also twigged that they are members of the mint family. 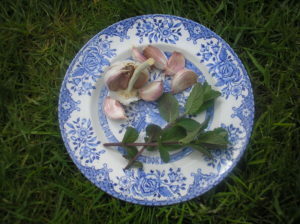 I decided to combine garlic and mint to create an even stronger repellent. I grow four different types of mint so I did a quick sniff test and decided that horsemint has the most powerful minty odour. Here’s how I made my spray mixture. Crush the garlic cloves and pop them into a bowl with the mint leaves, pour over the boiling water and cover. The mixture stinks so it’s worth popping the bowl outside to maturate. After 24 hours, strain the liquid and pour the refined garlic and mint water into a spray bottle. Spray any affected plants, remembering to reapply after heavy rainfall. My second discovery in the war on slugs is surprisingly simple: grapefruit. 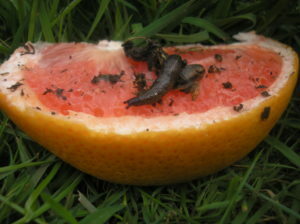 It turns out that slugs go mad for it and will head straight for this zesty fruit rather than eating your lovely plants. I took one large grapefruit and cut it into segments then laid them out all over my beds. It looks a little eccentric but, the following morning, I found slugs galore. Some were on the fruit pieces but more were underneath the fruit slice. I was able to scoop them up and move them to the green recycling bin. In one fell swoop, I collected more than 40 slugs. Meanwhile, my seedlings survived to live another day. Liquid fertilisers are another way we often unconsciously spread chemicals around our garden and into our pots. While these can seemingly help plants thrive, a natural version is so easy to make, better for the environment and free. I’ve made my own plant food for years out of comfrey leaves and nettles. 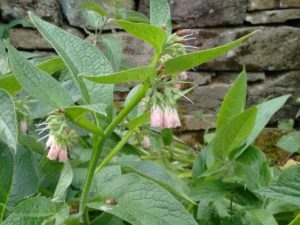 I collect a large bunch of nettles and several big comfrey leaves in the early Spring, chop them up with my gardening scissors and put them in a bucket with a couple of litres of water. I cover the bucket and leave it to ferment for about three weeks. The liquid produced by this process stinks to high heaven (imagine a cross between tooth decay and sewage and you’re fairly close) but it feeds my plants all Summer for free. I dilute this homemade fertiliser by adding a cupful to every watering can as I’m watering the garden. Comfrey leaves can also be left on the top soil to act as a slow release fertiliser as they break down. Obviously, all these natural options take a bit of extra time and effort but it’s worth it not to have to resort to chemicals which can’t be good for any of us in the long run. Happy slug hunting and fertilising. DISCLAIMER: These are some of my personal experiences combined with information I have researched over a number of years. I am not encouraging people to self-medicate. In the treatment of specific conditions it is best to consult a herbalist or your GP. If you should develop an adverse reaction to any of the plants mentioned above then please stop using them immediately. Always take care when identifying plants.